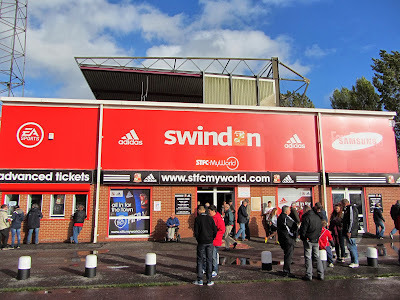 My twenty-fifth stadium of 2013 was on Saturday 2nd November 2013 at the County Ground in Swindon, Wiltshire. 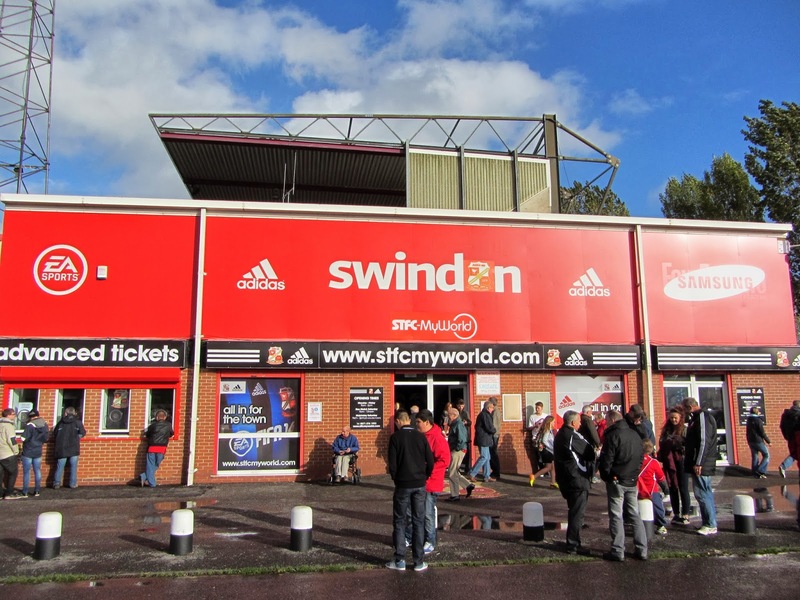 The match was Swindon Town vs. Port Vale in Football League One. The County Ground sits within a sports area in the centre of Swindon. The ground is adjacent to an athletics stadium as well as cricket and football pitches. The venue is just over half a mile from Swindon railway station and has been home to the club since 1896. 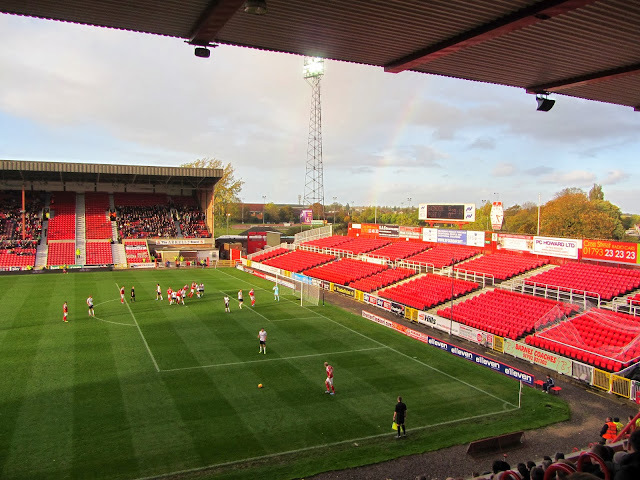 The largest stand in the ground is the Arkell's Stand which runs along the northern side of the venue - this two-tiered stand has a capacity of around 5,800. There are a couple of stanchions towards the middle of the stand which restrict the views of a small number of fans in the upper tier. This stand contains the executive boxes as well as the players dressing rooms. Opposite the Arkell's Stand is the Don Rogers Stand - this 4,800 seat structure has a cantilevered roof and provides unrestricted views of the pitch. 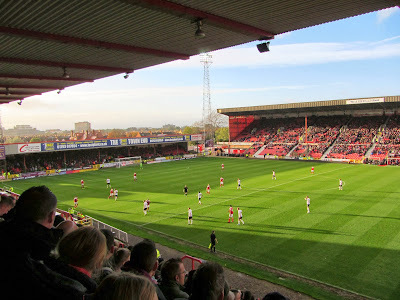 Behind the goal at the western end of the County Ground is the Town End - with approximately 2,000 seats this is the smallest in the venue and has several supporting beams in front of the seats. The Town End also houses the club shop and ticket office. The eastern end of the stadium houses the Stratton Bank - an uncovered two-tiered stand with 2,200 seats. This stand is usually closed and only opened if visiting teams bring a large away following. The two teams were only separated by goal difference going into this game but there was a real gulf in quality on display for the 90 minutes - Swindon were by far the better team on the day and it was no surprise when they took the lead in the 24th minute after Dany N'Guessan headed in James McEveley's free-kick from close range. Port Vale were fortunate to be only 1-0 down at the break but the home side were determined to kill the game off and in the 50th minute made it 2-0. Dany N'Guessan was again involved as his good run down the left-wing allowed him space to cross for Nile Ranger to head in on the line. In the 57th minute it was 3-0 as Massimo Luongo cut inside his marker in the box and fired a deflected shot past Chris Neal. It looked like Swindon were on their way to a big scoreline but Micky Adams made a triple substitution which got the visitors back into the game in the closing stages. In the 73rd minute a ball cut open the home defence and found Tom Pope who rounded the keeper before slotting the ball home. A few minutes later the deficit was reduced to a single goal when Lee Hughes tucked away Alex Yates' cross. Fortunately for Swindon any nerves they had were quickly settled as Nathan Byrne ran up the other end of the pitch and curled a superb effort into the net from the edge of the box. The final action of the game came in the 93rd minute when Massimo Luongo drilled low into the net after sidestepping a Port Vale defender. This goal rounded off a deserved 5-2 win for the home side.